Despite the sweltering heat at its equator, the closest planet to the Sun harbors ice at its pole. While the temperature on Mercury can reach a profound 800 degrees Fahrenheit, due to its lack of atmosphere and other factors, the shadowed craters of the poles can show temperatures hundreds of degrees below zero. This, along with decades-old radio data, has led scientists over the years to postulate that there may be ice at Mercury's poles, but until now that was only speculation. 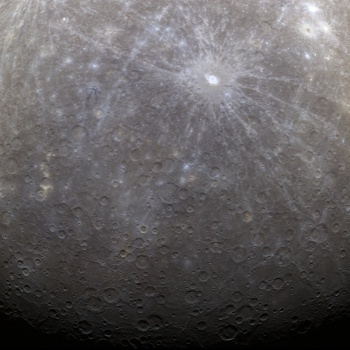 NASA's Messenger, which launched in 2004 and started its orbit around Mercury in March of 2011, has confirmed the existence of water ice in the deep craters of Mercury's poles. The data suggests that there are billions of tons of water ice, rather than just trace amounts. Using the craft's neutron spectrometer, Messenger measures neutrons streaming off the planet's surface and uses that data to infer what sort of material covers the area. Sean Solomon, principal investigator for Messenger, explains, "Neutrons are generated when cosmic rays hit a planet," elaborating, "Hydrogen is the best absorber of neutrons, so a neutron spectrometer looks for the signature of hydrogen near the surface by looking for decrease in the flux of neutrons coming from the planet." So when measuring the neutron flux at the pole, Messenger discovered that there were fewer particles flying off the surface of the planet, which implies the presence of H2O, due to the Hydrogen absorbing neutrons. This is in contrast to some earlier suggestions which posited that the recorded reflection of radio waves two decades ago may be due to the presence of some other reflective material. The alternate materials, however, would not show the same neutron absorption that water does, leaving water ice as the only explanation. "The surprise that we received on making the first chemical measurements of Mercury was that none of the theories for how Mercury was assembled are correct," Solomon said, "So we're having to rewrite the books on how Mercury was assembled, and by implication how all the inner planets were assembled."